Orange Park Medical Center is a full service, acute care hospital with 297 inpatient beds located in the heart of Orange Park, providing medical care to the counties of Clay, St. Johns and southern Duval. The continuous commitment to providing the highest level of quality care and service has taken Orange Park Medical Center from being a small community hospital to a top healthcare provider in northeast Florida. In November 2011, Orange Park opened a Provisional Level II Trauma Center that will save countless lives. Recent growth projects include expansion of the Emergency Department (ED) and a bed expansion to the North tower. Orange Park Medical Center is accredited by the Joint Commission on Accreditation of Healthcare Organizations (JCAHO). Orange Park Medical Center was again named one of the nation’s Top Performers on Key Quality Measures by The Joint Commission. Only 7 of eligible hospitals nationwide earned the award for both 2010 and 2011. Orange Park consistently receives top scores from CMS for patient care in the categories of Heart Attack, Heart Failure, Pneumonia and Surgical Care. Included among Orange Park’s awards and accreditations is recognition for effectively treating stroke and heart patients. This was highlighted in 2011 with the Chest Pain Center Accreditation and the American Heart and Stroke Association’s “Get with the Guidelines Stroke Gold Plus” award and in 2012 the “Get with the Guidelines Heart Failure Bronze” award. 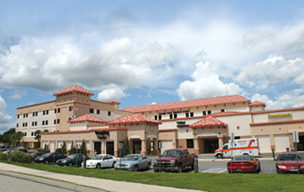 Orange Park Medical Center’s mainstay is its well-trained, dynamic medical staff. Its medical staff of more than 700 physicians represents nearly all specialties and is supported by over 1,450 highly skilled employees. Board certification/eligibility is a requirement for credentialing for the facility. Orange Park is located in Clay County just south of Jacksonville on the banks of the St. Johns River. Orange Park is part of the Jacksonville Metropolitan area, which comprises over a million people. About 20 minutes from the beaches, Orange Park offers excellent public and private schools, and a scenic riverside lifestyle.